Have we ever experienced a year when spring was so welcome?! Let’s hope the term “polar vortex” and its bite will quickly fade from memory. But no more whining – celebrate SPRING! Hurray! The air is warming, the sun is out, and the grass is turning green. Time to shed those coats, harness your pup in the car, and go for a ride to some of the canine events happening all around the metro area this season. Springtime offers a golden opportunity for you and Rover to roam all over town. While we don’t want to forget the giant annual events – head over to the APA’s Fast and Furriest or the Humane Society’s Bark in the Park, both of which should fetch a pretty penny in charitable contributions for worthy causes – don’t overlook your other options. If you’re left scratching your head, the St. Louis All Dogs Meetup Group does a great job of sniffing out canine events and maintaining a calendar on their website. There are also multiple doggie bone hunts around the Easter holiday, including two events in St. Charles that separate the large dog event from the small dog event – makes great sense! BauserHaus has donated three daycare packages to the doggie bone hunt event in Brentwood, coordinated by the Mid-County YMCA, the APA and Brentwood Parks and Rec, so don’t miss a chance for your dog to win these prizes! Here are some great pics from 2011. If you’re not sure if your pup will have good manners, be sure to bring him to BauserHaus for a day of play beforehand – he’ll be puppy in your hands. Nothing on the calendar when you and your pup are ready to get out and about? Create your own grand day out – visit your local frozen yogurt place and grab a treat. It won’t upset your dog’s tummy like regular ice cream; you can check out this great article in case you’re still concerned. Don’t forget to treat yourself while you’re at it! Your pup may have to wait outside for his yogurt treat, but area dog supply stores and boutiques will allow your dog inside to shop with you and might give him a free treat, too! But don’t just conform to the norm and only mark your territory in the County. We know you would love to mix it up a little across the border in the City! Head over to The Boathouse in Forest Park – always a dog friendly venue! And did you know the City has made it legal for owners to have their dogs with them at sidewalk cafe venues so you can take your pup to spots all over town, including several in Soulard? Here’s a great list. Even further afield is the Skyview Drive-In in Belleville, IL, opening for the season on April 4th! You can take in your choice of 4 movies with your furbaby, including Muppets Most Wanted. If you can’t find the time for these special canine activities, don’t get your dander up! Just the chance to get out of the house now that spring has sprung for a leisurely walk or a visit to BauserHaus is enough to keep your best furry friend happy. At the end of the day, our furry friends fill us with joy and laughter, no matter what the season! 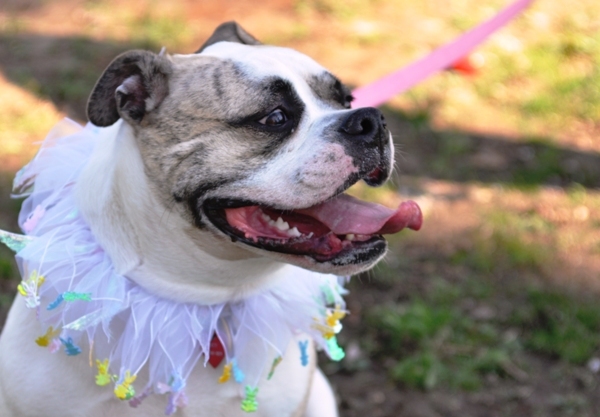 This entry was posted in Events and tagged BauserHaus, dog events, events in STL for dogs, Humane Society's Bark in the Park, Purina, what to do with your dog in the city. Bookmark the permalink.